Where the sheep all have names, the dogs all have jobs, and the mountains provide a canvas of color and beauty all year long. We welcome you to visit our farm and see for yourself the beauty of sheep grazing in the pastures, dogs doing a good days work, and the beauty of the Blue Ridge Mountains. Border Springs Farm is nestled at the base of the Blue Ridge Mountains in Patrick County, only 10 miles north of the North Carolina Border and 20 minutes from the picturesque Blue Ridge Parkway. 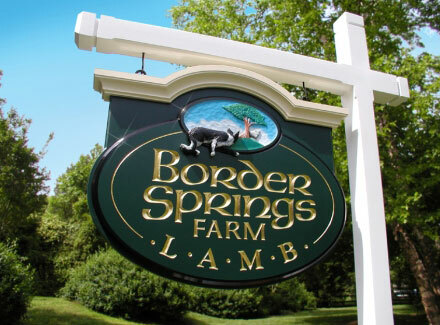 Border Springs Farm is a small family farm raising Kathadin and Texel sheep as well as working Border Collies. We raise natural lamb on our pastures and do not sell any processed lamb with ever treated with hormones or antibiotics. Texel wool is generally available to spinners and can certainly be reserved. We welcome visitors essentially anytime. We lamb twice a year, Thanksgiving to New Years, and again in March into April. The Border Collies work every day doing chores or tuning up for their next sheep dog trial, and the livestock guardian dogs never take a vacation. They are always on patrol. We invite you to come visit our farm, meet the dogs, and even help with chores. Bring the children to see life on the farm, the miracle of birth, the awesome talents of great working dogs, or just to see the mountains and the pastures with grazing sheep. Help us keep small farms alive and well. Contact us for information on visiting.